Yesterday I received an email from my sister detailing the events of our upcoming family get-together. Most of you don’t know me, but I am blessed with a large family who finds any reason we can to be together. 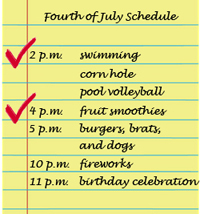 So large, I guess, my sister felt the need to create this itinerary for our Fourth of July festivities. As I look forward to this holiday with great anticipation of grilling out, cooling off by the pool, fireworks and family time, I hope your day is spent making many memories. No matter your “itinerary”, have an enjoyable day with your family and friends while you reflect on the meaning of this, and every, Independence Day. Tell us how your community plans to celebrate July 4th in the comment section below!